RC Sci Fi: Escape Pod Mk2 part4 Completed. Designing, building and kitbashing Radio Control Vehicles with a Sci Fi flavour. PLUS SPACESHIPS. 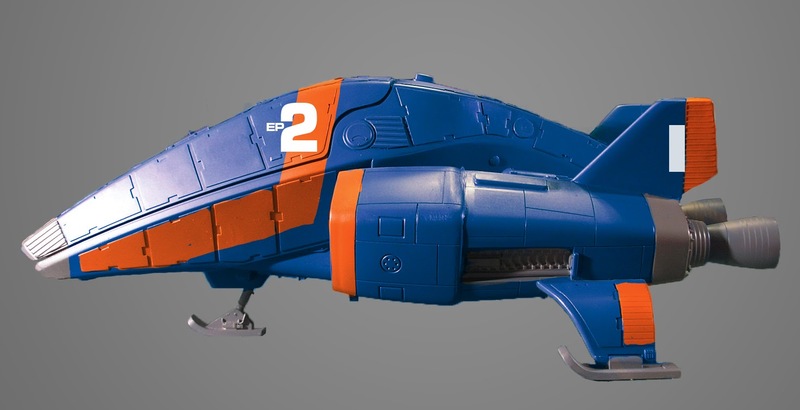 This is about the combination of two interests, Radio Control vehicles and Science Fiction models. Its also about vehicle design. The models have to satisfy two main precepts. 1. The vehicles have to work, ie be driveable, but not nescessarily win any races or rock crawling competitions. 2. The main thing is that they have to look cool. Escape Pod Mk2 part4 Completed. I set about coming up with a paint scheme for the Escape Pod Mk2 the same way I tackled the design of the paint scheme for the Kitbash Shuttle project, namely taking the side view image of the grey primer model and messing about in Photoshop overlaying colours till I had something I liked. The other deciding factor was that I had to make use of the colours I had on hand. Below is the original grey photo side view I started with and then the two rough versions I came up with. The two versions are the same colours but with the reciprocal placement. 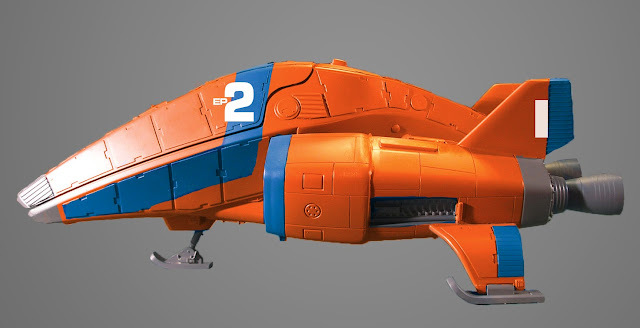 Because the Shuttle pod was already orange and I liked the mostly blue version best I chose that for the model. I had a spray can of Blue metallic car paint on hand. I don't usually like metallic car paints on a model because the metal flake is way over scale but it is what I had to hand and as it turned out once the weathering took off a bit of the gloss, I think it turned out OK. The white markings where sprayed on using white primer. The numeral 2 was done by printing out the computer font onto paper, sticking that paper onto the back of some wide masking tape and carefully cutting along the outline with a scalpel blade. The masking tape was then carefully peeled off the cutting mat and transferred to the model. In the photoshop mock up I had a couple of letters "EP" for Escape Pod but I found they were just too tiny to cut by hand and peel of the mat without ripping apart, so I abandoned them. The black lettering on the tail is some more of the old Letraset dry transfer lettering I recently re-discovered in a box at home and the red pinstripe at the rear is a bit of ancient Letraline found in the same stash. The weathering was done as per my usual technique described previously. I also painted up one of the cheap figures I found in Target for the cockpit occupant and added some control panels and a joystick mounted on the sides of the seat. That brings this project finally to a close but there are plenty more on the way. I started in visual effects in the old days (1987) building and destroying models and miniatures. I wanted to be a miniatures supervisor, but in the 90's along came CG and that was the end of that. I had to re-train and for over 20 years I worked as an animator and compositor in CG. It was no where near as much fun. In 2017 I began work as an apprentice machinist and am being re-trained to operate manual and CNC machine tools. Model Aircraft in the Cinema - A new project of mine. Scale Builders Guild RC scale vehicles forum. Real Models - My miniatures only, No CG Pinterest board. Rolled in kit parts -My other Pinterest board. ©mung. Awesome Inc. theme. Powered by Blogger.